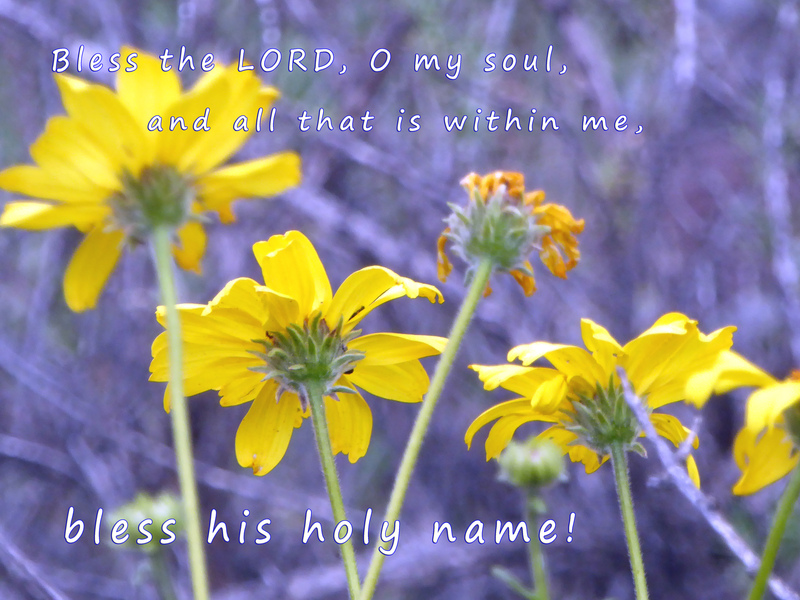 Bless the Lord, O my soul…! I chose The Message paraphrase because it reminds me of my own personal life, most recently–Psalm 18. You can also memorize it from the NIV. It’s shorter! b. Then I begin to say it out loud by memory. I might need up to 20 or 30 tries before I remember it all. c. When I forget, I just look at the words right away. I don’t waste time trying to remember what I don’t remember! d. Keep the verse handy. I have the verse printed or typed in very large letters on a small card, perhaps an index card, which I prop up where I am working or carry in my purse or pocket or wherever. I cannot practice memorizing something if I don’t have it with me at several points throughout the day. e. Eventually, by day number five or so, I find that I am beginning to be able to say the whole verse without looking. f. Finally, it’s just a matter of repeating what I now know, until I REALLY know it, and can say it out loud at normal speed. g. Being able to say the verse ALOUD is an important test of whether or not I actually know the verse. a. Simply take a sheet of paper and begin writing. On the first line, just write the first word. On the second line, write two words. On the third line, write three words of the verse. The important thing is to find a method that works for you and to not become discouraged. When we say the verse aloud at our next gathering, you will be amazed that you are not the only one who may have had difficulty memorizing the verses. I know that memorization does not come easy for me, and I am not just saying that. The advantage of memorizing verses together as a group is that we are accountable to each other. I find this accountability very necessary for myself. What I mean is, I do not have the discipline to go through this process simply on my own. Whatever else, be blessed and have fun! Colossians 1:13-14 God rescued us from dead-end alleys and dark dungeons. He’s set us up in the kingom of the Son he loves so much, the Son who got us out of the pit we were in, got rid of the sins we were doomed to keep repeating. Colossians 1:13-14 For he has rescued us from the dominion of darkness and brought us into the kingdom of the Son he loves, 14 in whom we have redemption, the forgiveness of sins.